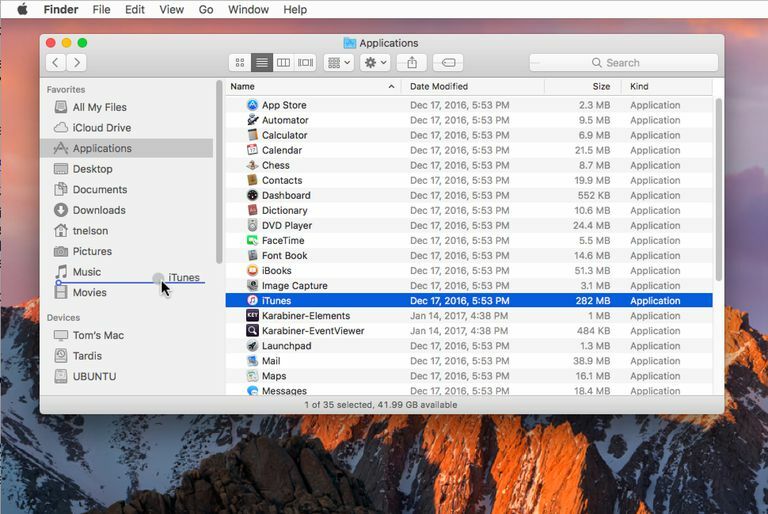 Besides files and folder, apps can be added to the Finder's sidebar. Screen shot courtesy of Coyote Moon, Inc.
Beginning with OS X 10.6 and in subsequent releases, you can hide the Finder's sidebar, so the window takes up less room, or display it to give easy access to many locations, files, and apps, all from the Finder's window. Select a Finder window, either by selecting an existing Finder window or by clicking the Finder app in the dock. From the Finder menu bar, select View > Show Sidebar or View > Hide Sidebar. You can also use the keyboard shortcut Option + Command + S to toggle between the two choices. Open a Finder window by clicking its icon in the Dock. Open the Finder's preferences by selecting Preferences from the Finder menu bar. Click the Sidebar tab in the Preferences window. Place or remove a check, as appropriate, from each item in the list of items in the sidebar. Close the Preferences window to save your preferences. Feel free to experiment with the items in the list. You can return to the Finder preferences at any time and modify the show/hide details. You can add your most often used files or folders to the sidebar to keep them a mouse click away whenever you open a Finder window. Click and drag a file or folder to the sidebar. A horizontal line appears, indicating the location the file or folder will occupy when you release the mouse button. With OS X Yosemite, OS X El Capitan, macOS Sierra, and macOS High Sierra you need to hold down the Command key when you drag a file to the Finder's sidebar. Dragging a folder does not require the use of the Command key. Position the file or folder where you want it to appear and release the mouse button. Although this isn't commonly known, the sidebar can hold more than just files and folders; it can also hold the applications you use most often. Follow the same steps as adding a file or folder, but select an application instead of a file or folder. Depending on the version of OS X or macOS you are using, you may need to hold down the Command key as you drag an application to the sidebar. To make matters even more interesting, depending on the version of the Mac OS you are using, you may need to set the Finders view setting to List before you can drag an app to the sidebar. You can rearrange most items in the sidebar as you see fit. Simply click and drag a sidebar item to its new target location. The other items rearrange themselves to make room for the item being moved. Like the desktop, the sidebar can become cluttered. You can remove a file, folder, or application you added by clicking and dragging its icon out of the sidebar. It disappears in a puff of smoke. Don't worry, though; the item itself is still safe in its original location. Only the sidebar alias is incinerated. If you don't mind forgoing the dramatic puff of smoke, you can remove an item from the Finder sidebar by right-clicking on the item and selecting Remove from Sidebar in the pop-up menu.